My mind can go faster than your car. or the space of hours. but its more like a curse. and twisted into my own stupid desire. like a washing machine on empty. pile of beautiful crunchy Autumn leaves. and that is a wild, bad and dangerous thing. for this so I do not SPIN-OUT OF CONTROL. can go faster than your car. you keep it inside and swaddle it like an infant child. escape to Eat Up the Whole World Whole. Wholeness…now that is something you long for. but there is nothing left but vast blackness. 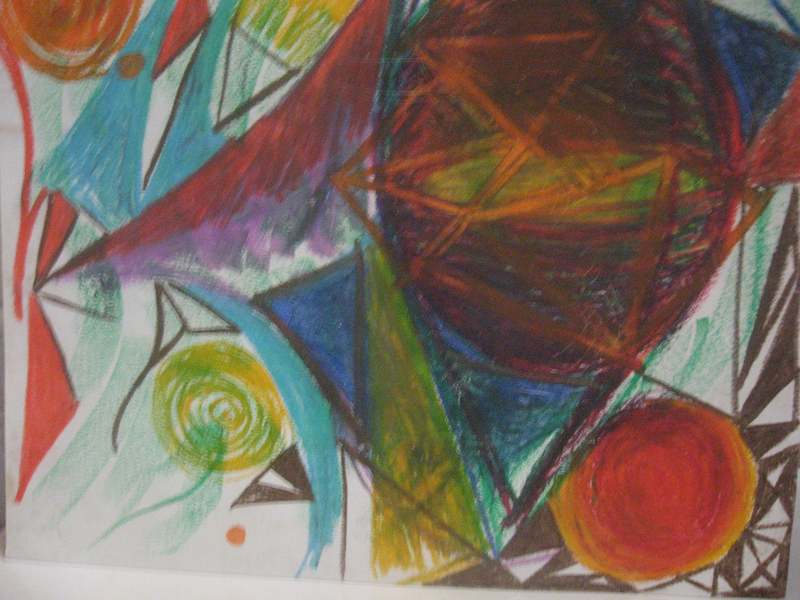 Old Abstract Pastel Drawing, from 1999, I created it back then, but why? I have no idea. Every bit of art I make somehow tells a story, I do not always recall my own. My story of how I made it, why I made it, what it meant to me at the time? I think What interests me much much more is what you as the viewer, think the art says to you? And why does it say that? What story do you see in my artwork? Is it confusing-a rambled jumble of colors and shapes? Or do you see symbolism or narrative in the layers , just beneath? Tell me what the story is? What does this old forgotten drawing done in oil pastel say about me-the artist? Or more importantly what does this artwork say to you as a viewer? Leave me a comment, play along if you wish, what do you think and what do you say the story is? bringing shivers up my spine. it makes me feel alive, precious and beautiful. to come home from a work outing. to see the Detroit Tigers play. while his mother hovers over me. Then there will be gifts and laughter. Right now is mere suspense. despite shivers up my spine. Beautiful poem and gorgeous artwork-a post by Wuji worth sharing! struggle with my brokenness. I stitch it together these shards of fragile self, like shards of broken glass. I weave my brokenness into a sweater. I keep myself warm for more stormy weather. How can I use my scars to heal myself? How can I use my scars to heal others? at least a small bit in my big and wounded heart? And yet, I cannot stop it. This endless sea of empathy. I want to help everybody I meet. I want to be useful, and unique. I want to be the one who bandages others, comforts them, encourages them. giving of myself-while I still bleed of emotions from time to time? someone else, a blessed and happy tomorrow? a new reality/for myself/and my family. it makes my mind spin. highly focused/motivated/able to get things done. up in artwork & poetry. to become part of mental health advocacy. in a sea of anonymity. from zero-to-one hundred/ on any given day. stories of old haunted places. To change it around, shake contents upside down. please shake contents upside down. How can I make it so? away in a puff of smoke? choke all of her best intentions? Only you can change your own mind. Mid afternoon, half past lunch. How we came to past? This gift of a marriage, based on mutual trust. take for granted almost everyday. a perfect fit, just right. all of our lovely fur-kids. for the luck of meeting and loving You. But I always make my way, back home to You.